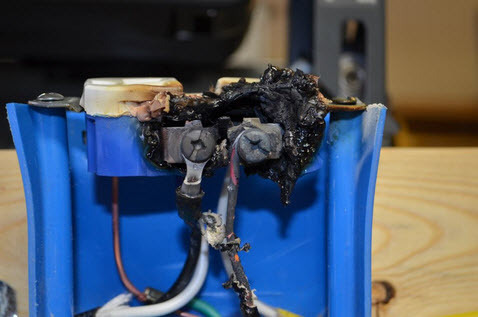 A recent Donan forensic fire investigation found that a poor connection in a floor-mounted duplex receptacle was the cause of fire. The receptacle was located in the area of origin and all other identifiable causes were eliminated during the investigation. While conducting the research for this particular case, Donan investigators evaluated many scholarly sources in order to clearly educate the client on how a loose connection in a receptacle could lead to a structure fire which, in this case, nearly consumed the bedroom. The best explanation was found in the chemistry associated with the formation of an oxide that contributes to the condition. Taking this conclusion a step further, Donan experts reproduced the mechanics involved in applying heat generated from a loose connection, to ignite surrounding combustibles. What followed was an experiment to better visualize glowing connections. The experiment consisted of two duplex receptacles mounted in plastic receptacle boxes attached to a piece of wood. Power to the receptacles was supplied by a short section of 14 American wire gauge (AWG) appliance cord connected to the first receptacle. The two receptacles were connected in a typical "daisy chain" fashion where the line conductors are connected in series to the load conductors. The primary receptacle receives the line (ungrounded "hot" and grounded "neutral") conductors on its binding head (BH) screw terminals, and a second set of conductors was extended to the second (downstream) receptacle. One BH screw was intentionally left loose on the hot load conductor on the primary receptacle. The other screws were securely tightened. Plugged into the downstream receptacle was a Holmes1500 watt tower-type space heater and a Proctor-Silex 1200 watt toaster oven. To further replicate the actual as-installed condition, the receptacle cover was screwed in place and fiberglass insulation was placed around the receptacle box. 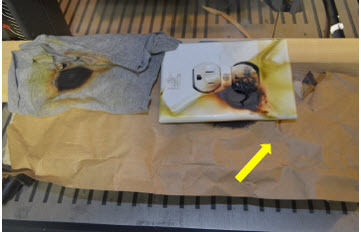 The cover quickly began to deform from the heat of the connection. As anticipated, the temperature rose dramatically and the heated cloth quickly began to generate smoke. 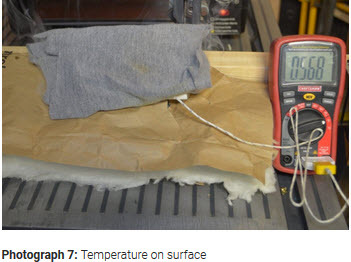 In approximately 6 minutes the temperature on the surface of the receptacle rose from 378 °F to 568 °F. This temperature is sufficient to ignite a variety of commonly found combustibles that may be in contact with the receptacle. The range of ignition temperatures for solids range from about 518 °F to 842 °F. Another location for a poor connection in a receptacle is between a plug blade (either hot or neutral) and the female receptacle receiver slots. The blades would conduct the heat of the connection into the cord and compromise the insulation, creating additional means to serve as an ignition source. Barring a current leakage condition, an equal current level is anticipated on the hot and neutral conductors, thus a compromised connection on the neutral side is equally capable of generating the same peril. Photograph 8: Damage to receptacle cover and cloth. 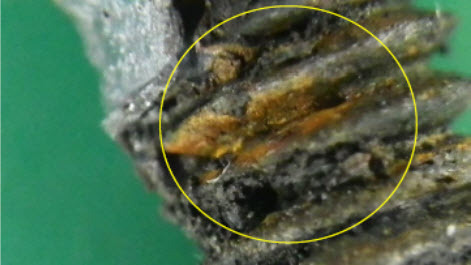 Note charred Kraft vapor barrier (arrow). Photograph 9: Damage to receptacle after one hour. 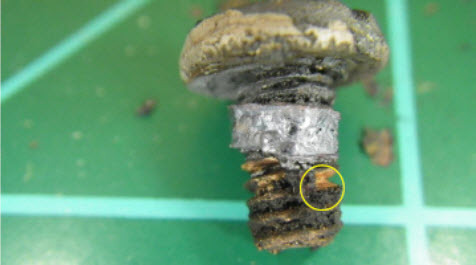 Photograph 10: Binding head screw from receptacle. Arc site inside circle. Photograph 11: Arc site magnified. 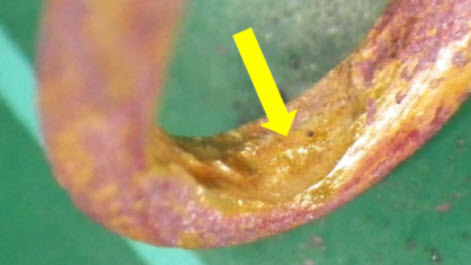 Photograph 12: Loss of mass on copper conductor. Arc site is inside circle. Seeing is believing. Several issues were confirmed in the experiment. Glowing connections can occur at screw terminals. Glowing connections can occur in a short period of time. Temperatures at the connection are extreme and capable of igniting commonly found combustibles. If the compromised area is insulated (as is typical in houses) the problem is greatly magnified. Nearby combustibles that may ignite can be: clothing or paper lying on top of the receptacle, drapes hanging in front of wall mounted receptacle, insulation vapor barrier, etc. A connected cord or modular device (phone or battery charger, air freshener, etc.) can transfer the heat to areas not in direct contact with the receptacle. The affected receptacle does not necessarily require anything to be plugged into it. 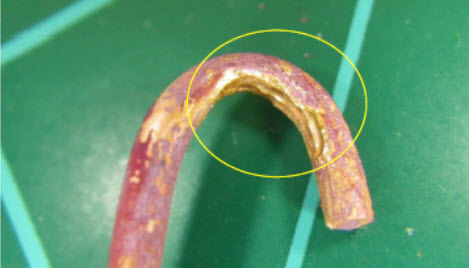 Note: No attempt was made to develop new chemical explanations or theories concerning the physical properties of a copper conductor when exposed to extreme temperatures as these have been done by others. This simple experiment was not intended to be a scientific laboratory study, but merely a confirmation of how an occurrence of a loose "glowing" connection can have serious consequence and cause significant damages. Sam Landis IAAI-CFI, CFEI, has been a Donan certified fire investigator since 2012 and is based out of the firm's Charleston, West Virginia office. He has 20 years of firefighting experience, and has conducted over 400 fire investigations in his twelve years as a fire investigator. Read more about Donan's Fire Investigation Division here. DONAN, a family owned company founded in 1947, provides full-service Forensic Engineering and Fire Investigation Services. For over 60 years, Donan Engineering has been providing unbiased answers to their client's complicated questions. Their team of licensed and experienced forensic experts provides investigative services in the fields of engineering investigations, fire and explosion origin & cause, roofing investigations, and component testing. The diversity of their multidisciplinary staff allows them to provide not only a complete service, but a complete service whose conclusions can be successfully and completely supported.